A lightweight (dashi infused) all purpose salad dressing. Great for seaweed and seafood as well as blanched greens. Hard boil an egg; parboil or saute spinach. 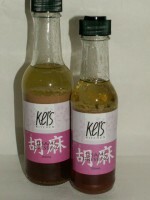 Pour on Kei’s Kitchen Sesame Dressing. Toast a piece of Turkish Bread or bread of your choice and top with spinach and egg in Sesame Dressiing. Yummy healthy snack for everyone. Slice wagyu beef into 7mm thin slices and barbecue (very quickly) or parboil like shabu shabu. Arrange on a bed of greens and pour on Kei’s Kitchen Sesame Dressing. Boil, drain and cool soba noodles and add a little vegetable oil. Season chicken breast with salt and pepper and a little sake and steam or cook in microwave. Cool, then shred with your fingers. Arrange on top of the soba, add some veges (whatever the kids will tolerate) and dress with Kei’s Kitchen Sesame Dressing. Trim ends of green beans. If pretty clean, don’t wash, but if you do wash, make sure to dry thoroughly. Heat some oil in frying pan when hot, add beans and fry. Drain and while still warm, dress with Kei’s Kitchen Sesame Dressing. The soft texture of the green beans is delightful. Nice as an entree. Trim and blanch white or green asparagus. Fan to cool or refresh in cold running water and pat dry. Slice into bite sized pieces and cover with Kei’s Kitchen Sesame Dressing. Kei’s Kitchen Sesame Dressing keeps for over one year in the fridge.